The knee is a complex joint made up of the distal end of the femur (femoral condyles) and the proximal end of the tibia (tibial plateau). A number of ligaments run between the femur and the tibia in the knee joint. 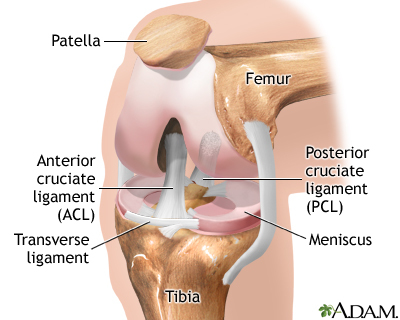 The anterior cruciate ligament, the posterior cruciate ligament, and the meniscal ligaments are among the ligaments of the knee joint.